We’re excited to announce a new partnership with CloudNine – and releasing LAW PreDiscovery as a new platform supporting import and export operations directly inside of ReadySuite. Combined with our Relativity platform integration, LAW PreDiscovery users can now bridge eDiscovery data directly between the two platforms via ReadySuite. Using ReadySuite, we’re providing two integration paths between LAW and Relativity. The first path will allow you to retrieve case fields, native, text, and page files from a LAW PreDiscovery case and into a ReadySuite session. With the LAW data in ReadySuite, users can leverage our vast script library to run custom workflows, such as splitting or merging date fields. Once data is ready to load, users can leverage our existing Relativity platform support, to load directly into a Relativity workspace. We currently support Relativity versions v9.4-v9.6 and RelativityOne. The second path will allow you to push field data directly into a LAW PreDiscovery case. Using ReadySuite, users can perform a sync operation from Relativity and overlay document coding and fields, such as a “Production Ready” tag, directly into the relevant LAW case. Above, you’ll see ReadySuite retrieving information directly from a LAW PreDiscovery case. 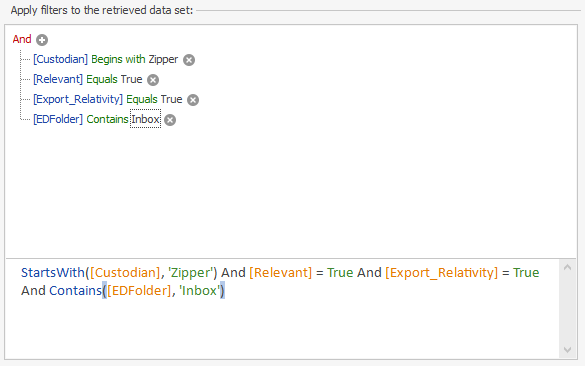 Retrieving data from LAW, users can select from common case filters, such as limiting the custodian or data source set. Additionally, we provide an advanced filter option, allowing users to build out a complex filter set. Loading data from LAW into ReadySuite does not require an export operation out of LAW. ReadySuite is retrieving the same set of files already loaded into a LAW case. Above, you’ll see data from a LAW case being pushed into a Relativity workspace. When you use ReadySuite to load LAW data into Relativity, you can skip both the export process out of LAW and separately, the ‘Copy Files into Repository’ step into Relativity, and reduce your network storage requirements. You can see more about our Relativity integration covered in this post. Above, you’ll see field data going from Relativity back into a LAW case. Using this option, users can save time, tagging relevant documents (or documents ready for production) from their Relativity workspace into a LAW tag or similar field. Don’t forget, Compiled will be exhibiting at Legalweek January 29-31, plan to stop by booth #335 if you’re attending.